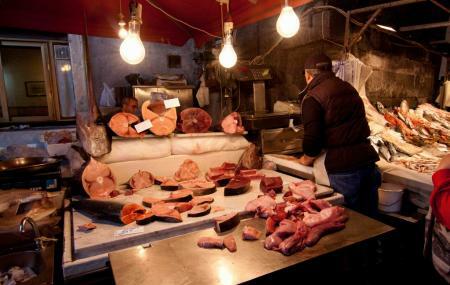 Find hotel near A' Piscaria Mercato Del P ..
Piscaria literally means fish and this is the oldest fish markets in Catania. A heaven for sea-food lovers, this crowded market not only sells fresh fishes but also has great eateries and food stalls serving scrumptious fish delicacies! Drop in here for a rustic fish meal to remember! Love this? Explore the entire list of places to visit in Catania before you plan your trip. Fancy a good night's sleep after a tiring day? Check out where to stay in Catania and book an accommodation of your choice. How popular is A' Piscaria Mercato Del Pesce? People normally club together Basilica Della Collegiata and Catania Cathedral while planning their visit to A' Piscaria Mercato Del Pesce. This is the heart of Catania and a vivid spot to get your food supply and being catch from all the good product you can see. There are many place where you can drink or eat something and you will being drenched from all the sounds and the look about. If it gets to busy you can move to some of the near by restaurants and relax. One of my favorite place at Sicily. Traditional market where everything is fresh from the land and sea. Food is based on the season and the food lasts for about 4days unless packaged and frozen immediately. It is truly a great experience to see Sicilian culture and how the locals live. ***when getting specific cuts of meat (American Style) it is not translatable and the butcher will charge a lot more then their normal prices. The market was really enjoyable. Whole family experience, including my two young children. It was really interesting to see all of the fresh fish and seafood. We enjoyed tasting the cheese and buying groceries for the week. Nice ambience and local feeling. Great place to buy fresh products.